I love this hobby for many reasons – but the main one (and I hope it comes through on this blog) is the friendships that it fosters. I remember moving to a new city shortly after university and not knowing a soul – but I stopped in at the local hobby shop, found out where the railway modellers socialized (at a supper club called OVAR), and within no time at all I had found some like-minded individuals who have gone on to become some of my closest friends. The great thing about the hobby is that these are people that I may never have otherwise met: Our careers are different… we lived in different neighbourhoods… we have different circles of friends outside the hobby… we have different passions outside the hobby… we’re all over the map, age-wise… and so on. But the hobby brings us together and the bonds forged through it are strong. I was reminded of this on the weekend. Late last week, Pierre Oliver got in touch and asked if I had any free time on Sunday. Pierre and I are close friends, despite living two and a half hours down the highway from each other. We always enjoy each other’s company, and he was coming to Toronto to meet up with a modeller from California who was in town on business. It was their first meeting, and Pierre wondered if I’d like to host an operating session on Sunday morning and then go for lunch. I’m always up for that – and I did have a free weekend – so we made plans. Our guest for the day was Michael Gross, who is in town to shoot some episodes of a television show he’s in. I’ve seen Michael on TV of course, and I knew that he is an enthusiastic hobbyist. (He’s an ATSF modeller who is building HO scale Free-mo modules with a granger branch line aesthetic. His modelling themes – wheat fields, feed mills, stock pens, and oil dealers on the Kansas prairie – are very similar to the ones I deal with in modelling a rural community in southern Ontario.) But to be honest, I never expected to meet him – much less host him for an operating session – if for no other reason than the fact that our home bases are separated by several thousand miles and an international border. – We ran trains (and the layout ran very well to my great relief). – We shared techniques – discussing everything from operating patterns and enhancing a simple layout with prototype practices… to effectively modelling agricultural areas… to the use of ambient audio to enhance the story we’re trying to tell through our layouts. – We exchanged thoughts about why we love the hobby. – We swapped tales of conventions we’ve attend and the characters in the hobby that we’ve met. 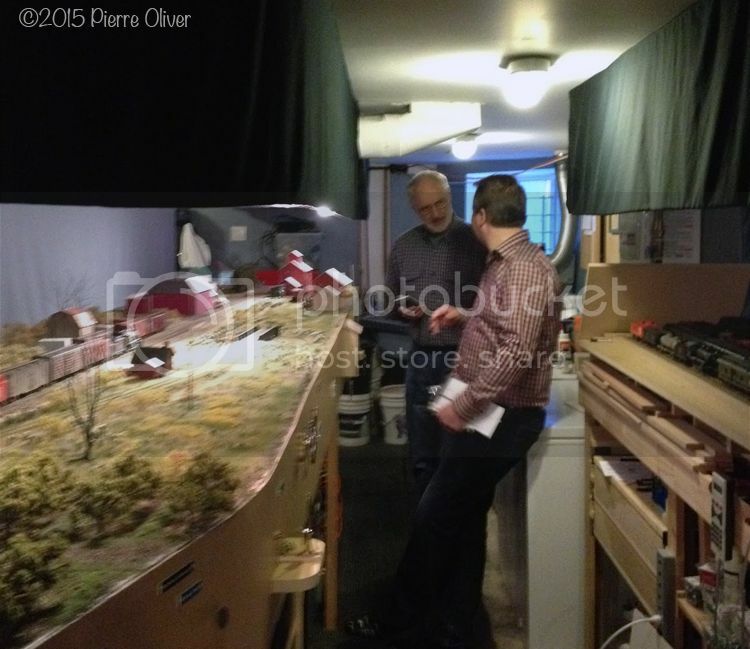 – We visited a local hobby shop – the Credit Valley Railroad Company – because it’s always fun to look for things for one’s layout when on the road. – And, joined by my wife Mairi, we enjoyed lunch at Harbord House and dinner at Harvest Kitchen – two of our many neighbourhood restaurants. Most of all, we had a wonderful time. Thus are old friendships strengthened and new ones forged. Michael: It’s wonderful to meet you and thank you for choosing to spend your day off with us. I look forward to spending more time with you whenever you’re in Toronto with some free time in your schedule and the desire to talk trains. I had a fantastic day – and I’m inspired to make some more progress on the layout as a consequence: Time to find some clear space, some tools, and another project! What a great post Trevor and so true I have made lots of friends and acquaintances from all walks through the hobby and even run into some work colleagues who turn out to be closet modellers. The common bond is the railways and I can’t put my finger on why but I just know it brings me and others skills, camaraderie and downright fun. Trevor, I’ve had hundreds of visitors drop by for a visit to my layout over the years, including folks from as far away as Australia and New Zealand. All of this has resulted from our common denominator, model railroading. I normally hold two open houses each year and host around 50 people at each one. I have even more people who take advantage of my “If I’m home, I’m open for visitors to come by for running trains and/or talking about trains or learning how I do whatever the visitor is interested in learning the how-to about. I really enjoy these visits as they are interesting and fun. I had one such visitor just this morning. He wanted to learn more about how I installed my DCC system and how to install DCC in a locomotive. Our one hour visit lasted almost three hours. Good fun and some education took place.